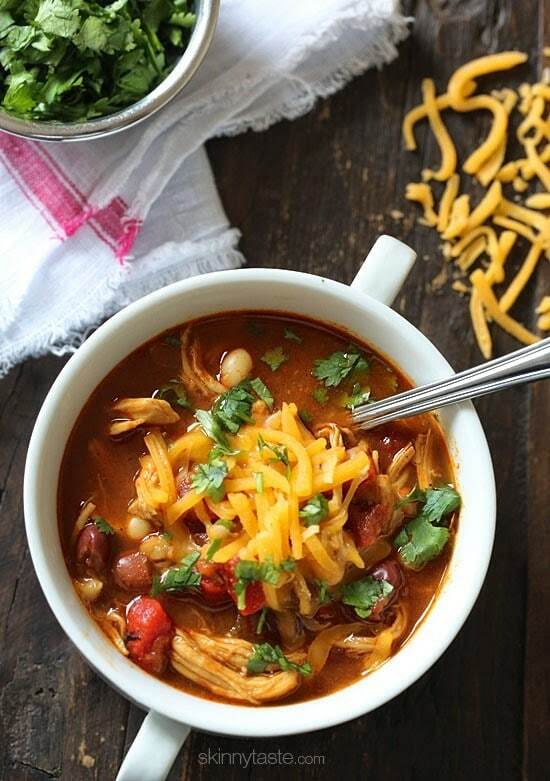 A delicious twist the traditional chili recipe – shredded chicken, beans and BBQ sauce simmered in one big pot with just a touch of sweetness that makes this meal Seriously Delish! I’m sharing this wonderful chili recipe from my friend Jessica of How Sweet It Is, who just came out with her first cookbook – Seriously Delish. 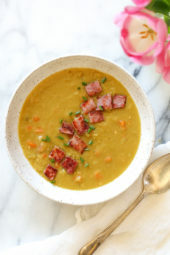 I’ve always loved reading Jessica’s blog, she’s adorable and her book is just as fun to read, filled with beautiful photos and tons of great recipe ideas. I really wanted to make everything in her book, but I figured since it’s September, and the kids are back to school, this chili is perfect. A hearty, one pot meal that makes enough for several meals and leftovers are perfect to pack for lunch or can be frozen for another day. I didn’t make any changes to her recipe, they only thing I adjusted was the serving size – I found 1 cup to be filling and the perfect portion size. 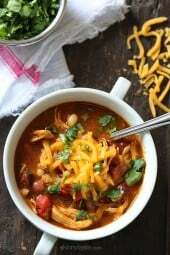 A delicious twist on traditional chili – shredded chicken, beans and BBQ sauce are simmered in one big pot which has just a touch of sweetness that makes this meal Seriously Delish! Heat a large pot over medium heat and add the olive oil, onion, jalapeño, and garlic. Cook until soft, about 5 minutes. Add the paprika, chili powder, cumin, black pepper, salt, and red pepper flakes. Stir and cook for 2 to 3 more minutes. Add the chicken, red peppers, beans, chicken stock, tomatoes, and barbecue sauce, stirring to combine. Cover the pot, lower the heat to medium low, and cook for 20 minutes. Remove the lid and taste, adjusting the seasoning to taste, if needed. Cover and cook another 10 minutes. Ladle the chili into bowls and top with cheddar cheese and cilantro. Enjoy! Press saute, add the olive oil, onion, jalapeño, and garlic. Cook until soft, about 5 minutes. Add the paprika, chili powder, cumin, black pepper, salt, and red pepper flakes. Stir and cook for 2 to 3 more minutes. Add the chicken, red peppers, beans, chicken stock, tomatoes, and barbecue sauce, stirring to combine. Cover and cook high pressure 10 minutes (if using raw chicken, 15 minutes). Natural release, adjusting the seasoning to taste, if needed. I don’t eat red meat so I made this recipe for myself and regular ground beef chili for my husband. He actually preferred this! It’s just the right amount of sweet and hot. And even better left over. I don’t eat read meat so I made this recipe for myself and regular ground beef chili for my husband. He actually referred this! It’s just the right amount of sweet and hot. And even better left over. Made this tonight with the last of my leftover Thanksgiving Turkey instead of chicken and it was delicious. Cold, rainy day here today. We went to a movie and I had no idea what I was going to make for dinner. Searched your site and whipped it up in 40 minutes. Family loved it! Thanks Gina. I made this recipe because it sounded tasty and I had all the ingredients on hand. I cannot tell you how delicious it was. My husband and adult daughter went crazy over it. the only changes I made were that I added more chicken and another can of beans. I highly recommend this! 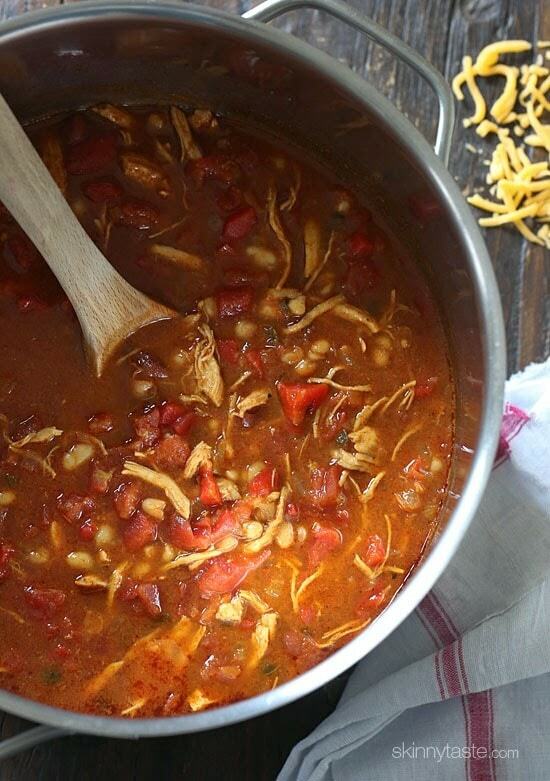 This bbq chicken chili is amazing! By far my favorite chili! This is our absolute favorite Weight Watchers Friendly recipe! I’m certain we have it at least once a week–by popular request. I love to vary the flavor of the soup just by changing the barbecue sauce used. The last time I made it, I didn’t have any roasted red peppers, but used fresh instead and still loved it! I can’t get enough of this on a cold day. This is the first soup I have never “doctored” up the flavor. Excellent! I am totally making this for my family this weekend! Sounds delish! If I were to leave the cheese off what would the new smart points be per cup, 1 pt? I made this BBQ Chicken Chile a couple of days ago and my husband and I both love it! it gets better each time we eat it as the flavors meld together. Delicious! This is definitely a recipe I will make again. IF cooking with raw chicken in the instant pot do you just add the chicken breast whole and then shred after it cooks? Just made the BBq chicken. It was delicious! Bravo Gina!! How would you do this for a crockpot version? I see your comment on shredded chicken the last 20 minutes but how long should it be in the crockpot whether high or low? 4 hours high or 8 hours low. LOVE this chili recipe! Made it multiple times so far! Wanted to make it today but ran out of chicken… Can I still make it with ground beef? If so, what changes to the recipe do I need to make? Should I cook it longer? Thanks!!! I've made this three times already this year and it is probably my favorite dinner of all time! Thanks so much for this!!! How would you do this in the crock pot? Im from Finland and I had to improvise a bit with this recipe but so amazing nevertheless. I'm not familiar with this kind of food but heavens.. This is like the best ever. THANKS! Do you know how much of the fat is saturated fat in this recipe? Thank you! I made this in the crock pot. Stuck to the recipe except omitted all of the broth and it turned out awesome! Can I add cooked shredded chicken and follow the instructions as is? Also, can we use black beans instead of the cannellini beans? Was this at all spicy? Sounds delicious! This looks really good. I love trying new chili recipes. Do you think this would work in crock pot? Sure! I bet it would!! Wow! So delicious! I wanted to try something different with chili and this was so good. Sweet and a bit tangy. I added shredded rotissere chicken and fresh bell peppers. Came out great. I love all of your dishes Gina! Thanks again your the best! Really delicious chili – quite different from any of my usual versions! Liked the soupier consistency. BTW, when I cooked the chicken breasts before hand, I poached them with a jalapeno in the poaching liquid. Worked well and gave the liquid and chicken added flavor. I used the poaching liquid for part of the chicken broth in the chili recipe. Gina, what bbq sauce do you like to use? I used my own homemade sauce since I had some in my fridge, go with your favorite! Made this tonight for my family and it went down a treat!!! So yummy and easy to make! I will say that it tasted more like taco than bbq… but maybe I messed up on the spices.. Either way, it was delicious! This is by far the best chili recipe I've ever made! Love your recipes Gina!! This looks super delicious too! If I make in crock pot, should I add all ingredients at once?? Made this last night and it was delicious! Added the chicken breasts raw to the simmering chili and pulled them out after 20 min, shredded them, put it back in the pot, then simmered another 10 minutes. I simmered with the lid off to help thicken up the chili a bit. Great flavors, super filling. 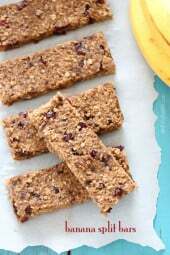 This is so delish and easy to make! I made this on Saturday and it was delicious! Great for a fall day in Ohio. Thanks for sharing it! Thank you for another great recipe. I did mine in the crock pot with a few minor changes due to ingredients on hand & family taste. I had some ground chicken breast which I browned first. Since my family is pretty wimpy when it comes to spicy foods, I omitted the jalapeno & crushed red pepper. Used a can of Rotel & 1 can of regular tomatoes. Cut back a little on the chili powder but added a bit of ground chipotle. Everyone devoured it! This one is a keeper!! I agree with the above poster that it came out runnier than I had expected of a chili, but served over rice it didn't matter. We topped with avocado and crushed tortilla trips. I have a picky 10 year old who ate the heck out of this chili! Said it was the best chili he's ever had. Thanks Gina. Great! If you like a thicker chili you can cook it longer or use less liquid. Made this and it came very liquid in the crock pot.Good nonetheless.I used rotel since I had no jalapeno,and didn't use the bellpepper because I thought I had some and I didn't.It was tasty though. I made this last night and it was amazing! It might replace your Chicken Taco Chili as our standby! I followed the recipe to a T but I only came up with 8sih, maybe 9 cups when it was done, so I'm not sure what happened there. We will definitely make it again and again! Also would like to know what BBQ Sauce you used! Pinning to try! 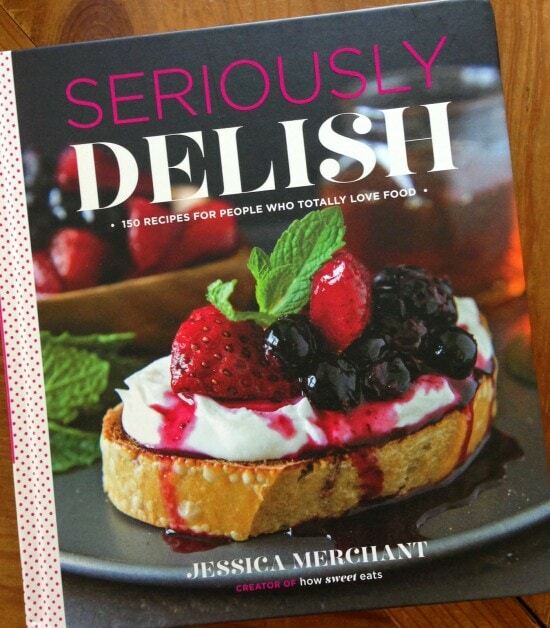 This is the second post I've run across today mentioning Jessica's new book! This chili looks so comforting and I'm sure my family will enjoy it with the cooler temperatures coming our way(hopefully soon). Thanks for sharing, Gina! Made this 2 days ago. It was a hit with the hubby (not so much with the kid). Thanks! I thought I posted a comment but now I can't tell, so I'll try again and sorry if it's repeated! Made this last night, and it was fantastic! I used one can of regular diced tomatoes and one can of Hatch brand diced tomatoes with chilis. This paired with the smoked paprika made my chili spicy, on the edge of too spicy, but nothing a little sour cream and cheese couldn't fix! I also followed Gina's recommendation of adding my uncooked chicken in once the ingredients were all simmering. I let it cook 15 min (I had cut the breast into smaller chunks so it'd cook faster, and I used a few thighs), shredded, and then simmered for 10 min. It worked great and eliminated the need for precooked chicken! Overall great recipe, it's perfect for fall/winter and I will definitely make again! Wonderful! So happy you enjoyed it. Is the chicken cooke previously? Or is 20 minutes long enough for it to cook? That recipe sounds … seriously delish! Need to get that book. The chili is perfect for the fall football games! Hi Gina! I love all your recipes and can't wait for the cookbook to come out. I've got a quick question about this recipe. I have a stomach allergy toward any sort of bell pepper. Normally I would just leave the roasted peppers out, but I'm guessing that the roasting adds quite a bit of flavor to the chili. Do you have any suggestions for something I could substitute in? I love the idea of barbecue sauce in chili. Jessica always has the most amazing ideas! This sounds good but I am wondering also what type BBQ Sauce to use so as not to compromise the WW Points. I also use Knorr HomeStyle Chicken Stock and it is very good. You girls should check it out! Thanks Gina!! Sounds sooooo good! I looove Jessica's recipes! 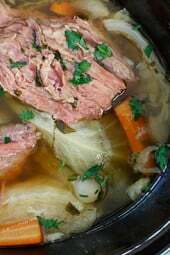 Can I use chicken broth instead of stock? What BBQ sauce should I use to get the same calories in the end? Oh this sounds so good to me right now! Perfectly cozy for fall! And I've never put BBQ sauce in chili before. And I don't know why. Seems obvious that it would be delicious! Can't wait to get my hand on the book! This looks fantastic!! Gina…. do her recipes have WW points on them or is it easy to figure out with a WW calculator? looks like a fabulous book but really need the points info. thanks so much – adding this to my weekly menus! No her book doesn't have calories or points, I should note it's not a low calorie book. This looks perfect for the rainy day we're having here in Vancouver! Can't wait to get her cookbook. This looks amazing…great for a grey day. Thank you! can you make this in the crock pot and cook the chicken with the other ingredients? How long should I cook it in the crock pot for? 4 hours high or 8 hours on low. I would use less liquid. Gina: how much less liquid would you recommend? Thanks in advance! I would guess a 1/4 cup. I'm definitely going to add this to my stash of chili recipes! yes, that for sure would lower the sodium, eliminating the cheese would also lower it. What about using your homemade BBQ sauce recipe too? I bet that would lower sodium as well?? Ok, I was going to make your chicken taco chili this week–but now am making this! Do you cook the chicken in any particular way before shredding it and adding it to the dish? I usually do it in the crock pot, but here I added the chicken the last 20 minutes of cook time and shredded it after. I poach mine, then shred. I cook my chicken (usually thighs) in a stock pot with the skin removed first for all my recipes. I always have a use for the chicken stock. We're on a very strict food budget and that saves us lots of money. Stores in a mason jar very well for a few weeks or in an airtight freezer container for 4 to 6 months.